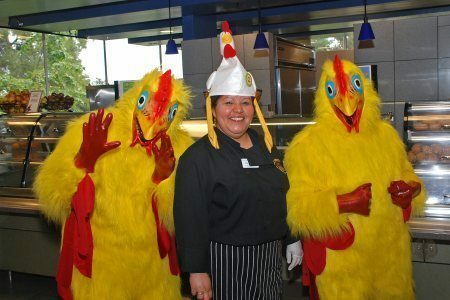 UCLA Dining Services has committed to buying only cage-free and Certified Humane eggs for all residential restaurants. This commitment was made in April 2010, largely a result of efforts from Bruins for Animals!. Dining Services purchases approximately 1.5 million Certified Humane eggs annually from Wilcox Farms—meeting sustainable foods criteria listed in the UC Sustainable Practices Policy, which require 20% of all food purchases to be sustainable by 2020. 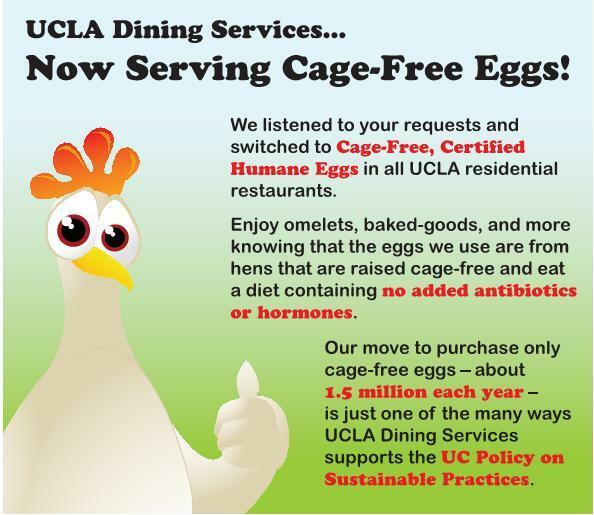 In April 2010, UCLA Dining Services agreed to buy eggs that are produced cage-free and “Certified Humane” for all the residential restaurants in UCLA’s on-campus housing facilities. Wilcox Farms will supply the more than 1.5 million eggs consumed each year by students and other Dining Services guests. This move responds to student requests for food products that involve the more humane treatment of animals and supports the UC Policy on Sustainable Practices. The “Certified Humane – Raised & Handled” designation is awarded to egg producers who meet guidelines developed by Humane Farm Animal Care (HFAC) – a national nonprofit organization that certifies the humane treatment of farm animals. According to HFAC, “Certified Humane” for laying hens means that they are not only raised cage-free, but also must have ample space, shelter, and gentle handling to limit stress. Nesting boxes are required, and the hens must be fed a healthy diet of quality feed without added antibiotics or hormones. An official roll-out to announce the change to students and raise awareness about sustainable food options took place at brunch on Sunday, May 16, 2010. Diners at three of UCLA’s residential restaurants – Covel, De Neve, and Hedrick – were greeted with fun decor, information on cage-free eggs, and a few surprises. UCLA Dining Services is a department of UCLA Housing & Hospitality Services. It operates four residential restaurants and four take-away eateries in the UCLA’s on-campus housing area. A staff of approximately 500 team members provides food service to more than 9,500 student-residents plus staff, faculty, and campus visitors. For more information about UCLA Dining Services or this particular news item, please contact Christine Kubo Loh, Communications, UCLA Housing & Hospitality Services.